The advent of recent food safety initiatives, combined with the continue complexity and magnitude of trade promotion spending (and rebates), and the need to be very precise with food ingredient, nutritional and GHS labelling, has dramatically increased the need for tools like PLM (Product Lifecycle Management (Formulating), Trade Promotion Management and Food Safety Solutions. In addition, the recent increases in the need for end to end traceability, shelf life management, and product segregation, have resulted in the continued increase in the need for more advanced Warehouse Management Tools. Our vendor eco-system is the only one its kind which has assembled this comprehensive group of solution providers focused upon the nuances of the food and beverage industry, on a global scale. 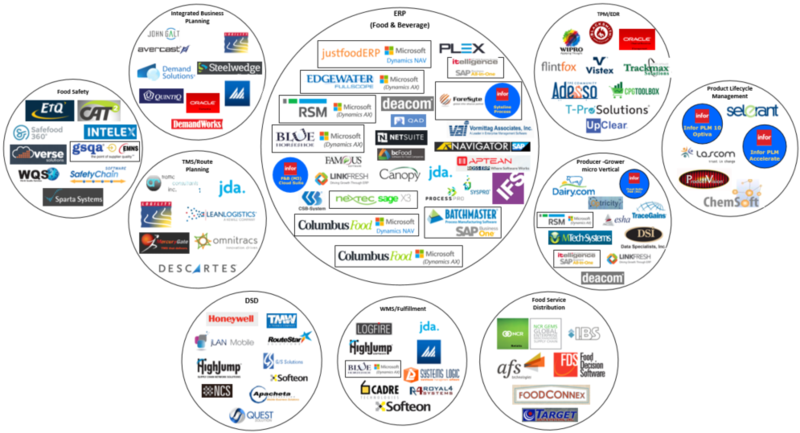 For more detail on the Solution Ecosystem for Food & Beverage Manufacturing, please see our report in the Resource Center Vendor Profiles, or just click on the link above.